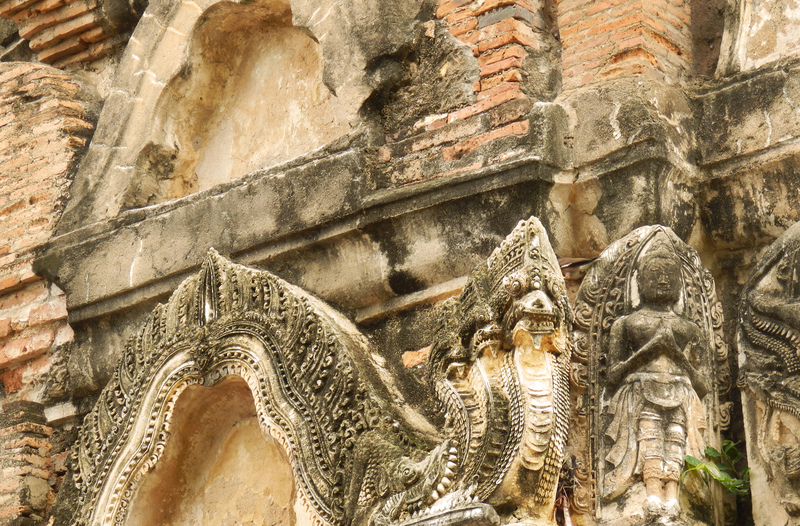 The kingdom of Siam went through a number of capitals over their history. 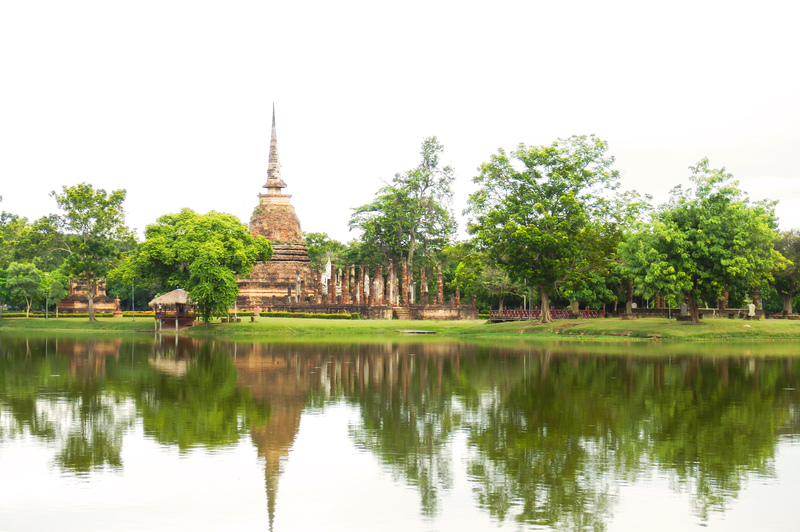 Sukhothai was the dominant power during the 13th century following the fall of Ayutthaya (also accessible by train from Bangkok). 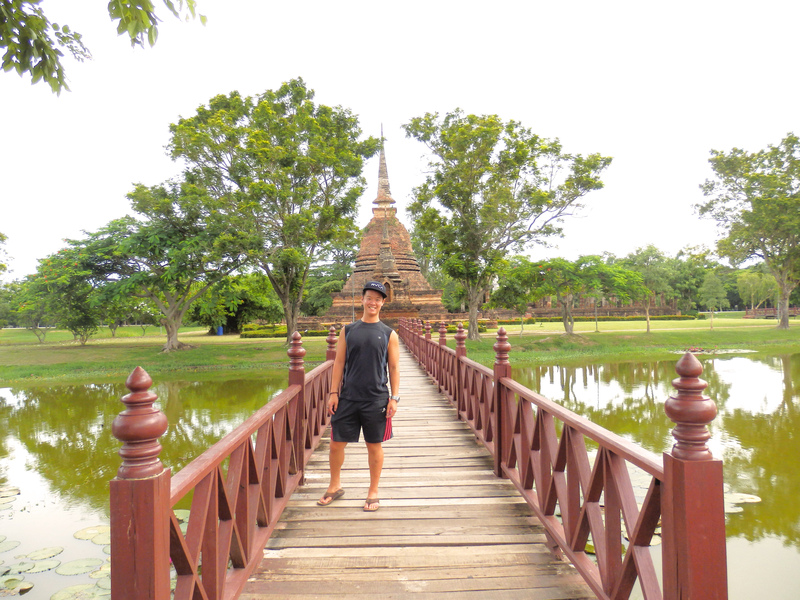 I wanted to come here because it was a great stopover on the way to Chiang Mai, but also because this was not a super popular city. 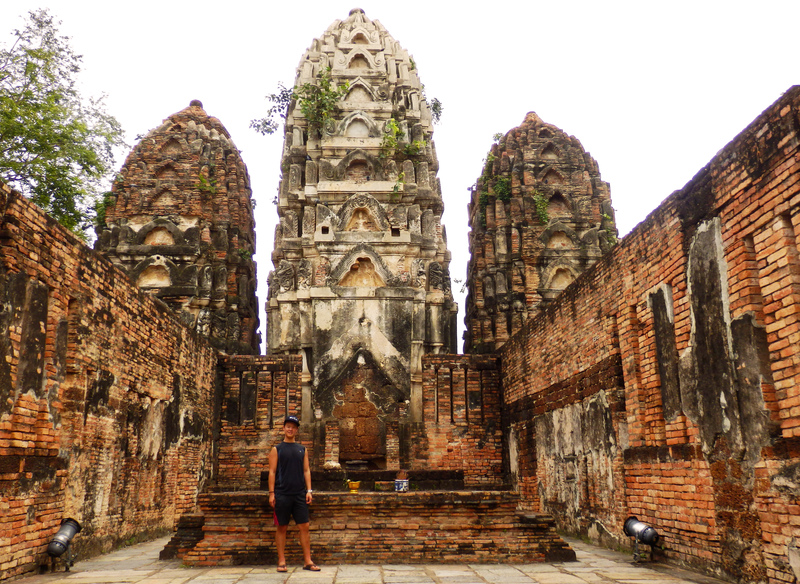 This would allow us to explore the temple ruins and get away from the hoards of people in Bangkok. 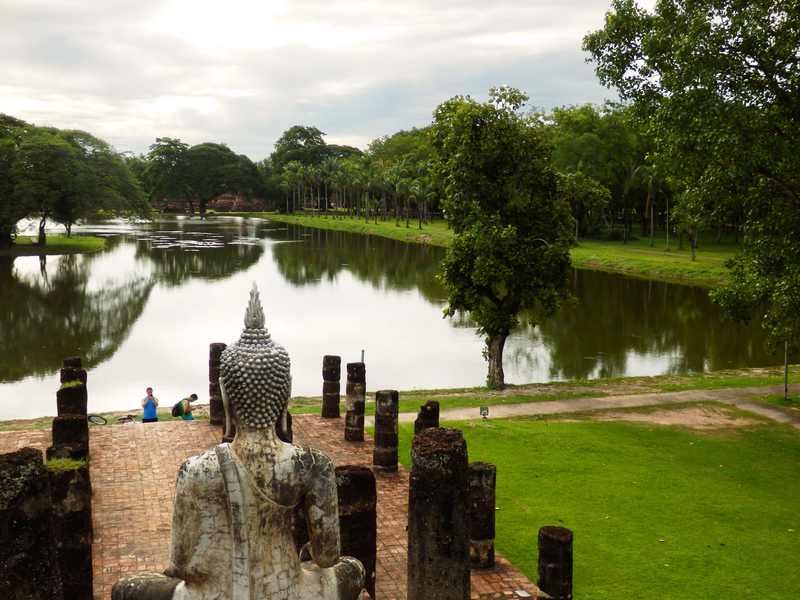 The historical park, which contains all the ruins of the walled kingdom, is within the Old City. When we got here, it was more than we could have asked for. We arrive in the evening and long story short, our reservation did not go through. We ended up walking around the dark streets for over an hour before a nice hotel owner called a friend to squeeze the 3 of us into a single room. Problem was we had no food because this hotel was in such a remote area. 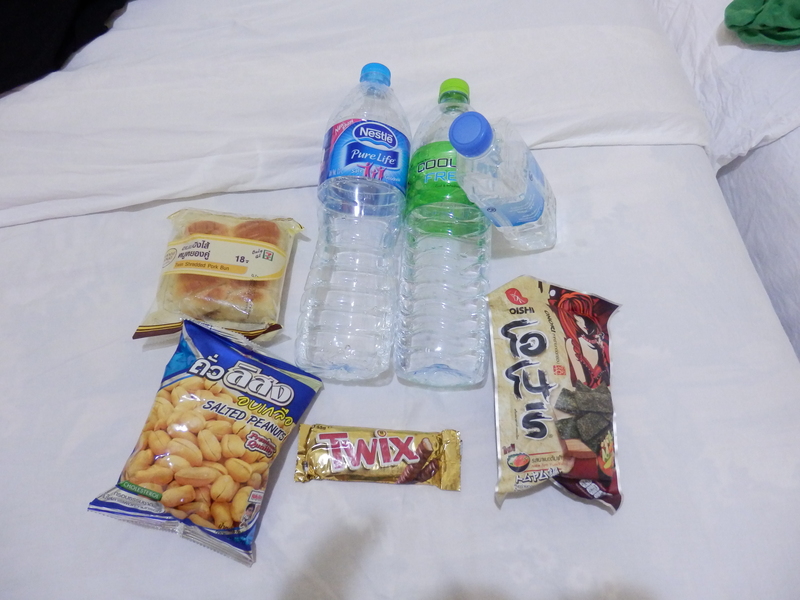 Our dinner comprised of 2 bottles of water, a bag of seaweed, nuts and 2 buns for 3 people. Great. We get up nice and early and rent some bikes to explore the ruins. The sky was overcast but the heat and humidity were definitely there. Riding into the complex on bikes with the air rushing past us was a great relief for our already sweaty bodies! 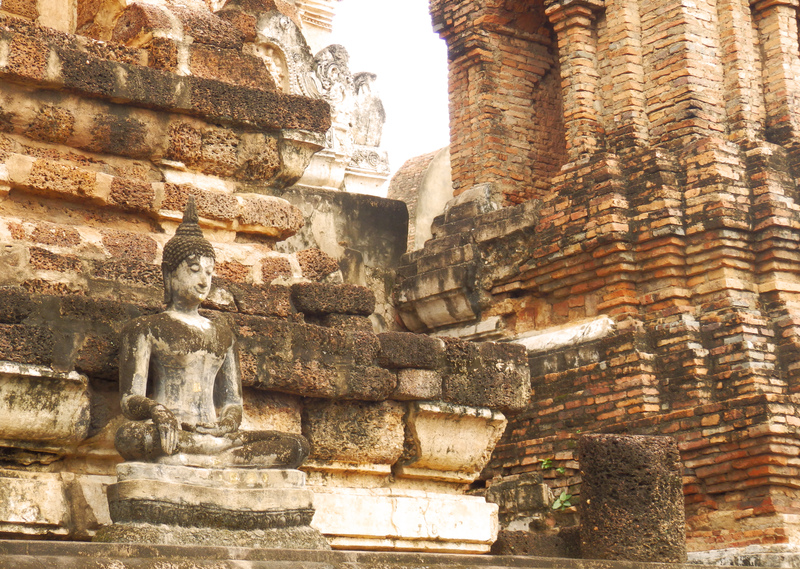 There is temple after temple, all in various states of disrepair, although with special attention paid towards the Buddha statues inside some of the temple ruins. Monks still come here to pray here but the complex is not crowded by any means. 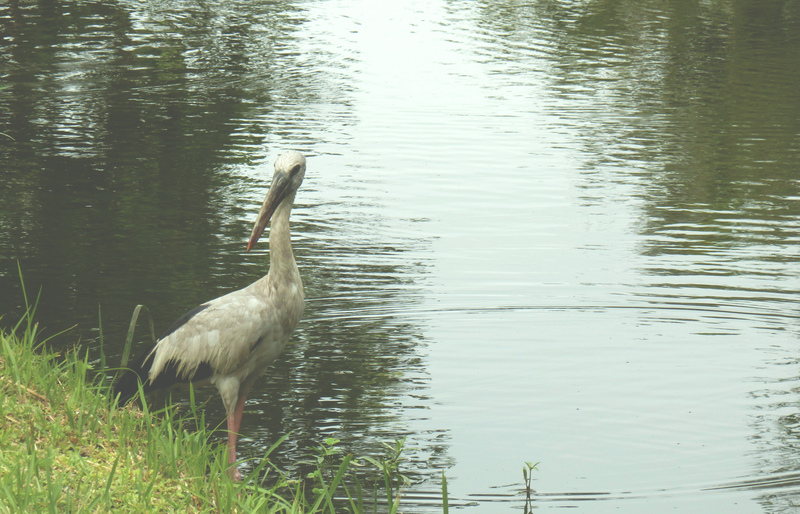 It is a large complex and the number of tourists at the high season that we went were quite low. The ruins are all made of similar materials of ochre coloured bricks. 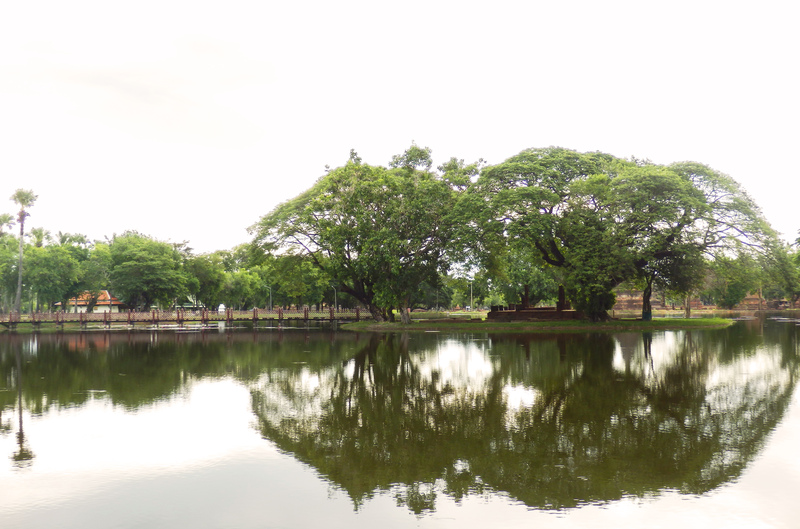 Some of them are surrounded by moats or lay on the edge of lakes that reflect the grandeur of the more elaborate structures. It’s quite hard to imagine what this place would have looked like in its hay day, since the temples seem to dominate much of the walled city. 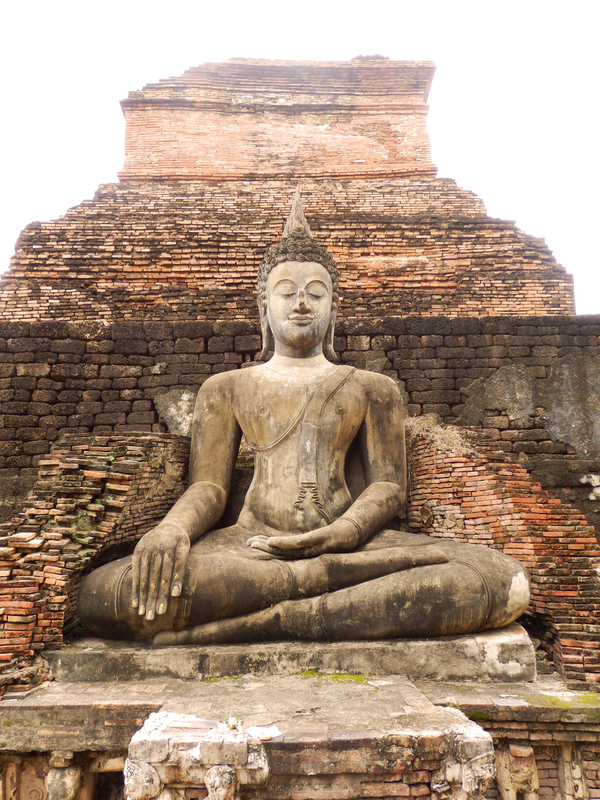 I imagine, like today’s Thailand, spirituality held a prominent position in the lives of the people back then. By the afternoon, we were exhausted and sweating like dogs. As we bike along the main road of the old city, you can hear prayers by some Buddhist monks that have set up pavillions for a special weeklong holiday (which we later find out requires Buddhists to observe sobriety). Further along the road towards the new city, the concrete buildings turn to wooden huts immersed within forests of palm, coconut and banana streets. We eventually make our way to a hotel with a decent pool and pay to spend the afternoon using their pool. 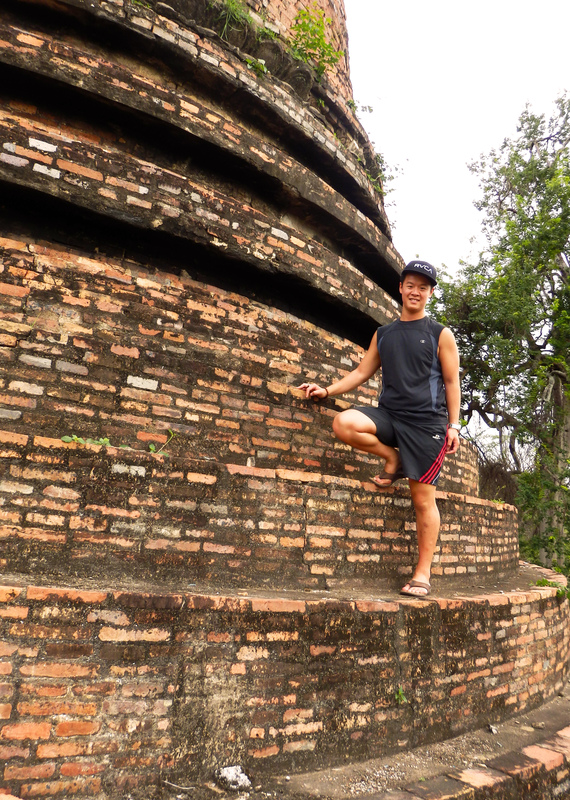 This would seem odd but what I love about Thailand is that people here are flexible. The manager saw that it wasn’t busy at the time and let us use the pool to relax for around $3. But more importantly, there’s room for creativity and self-planning your itinerary. Rather than being stuck at our hot hotel room, we sought out an alternative, which may not have been possible in let say, Europe. That evening, we ate well at a local nightmarket that sold a bunch of random trinkets. I was definitely there for the wide array of food that was available. I seemed to have been going through a banana fritter phase and had to order this at least twice a day. Fresh, hot, crispy, custardy and sweet. Damn! 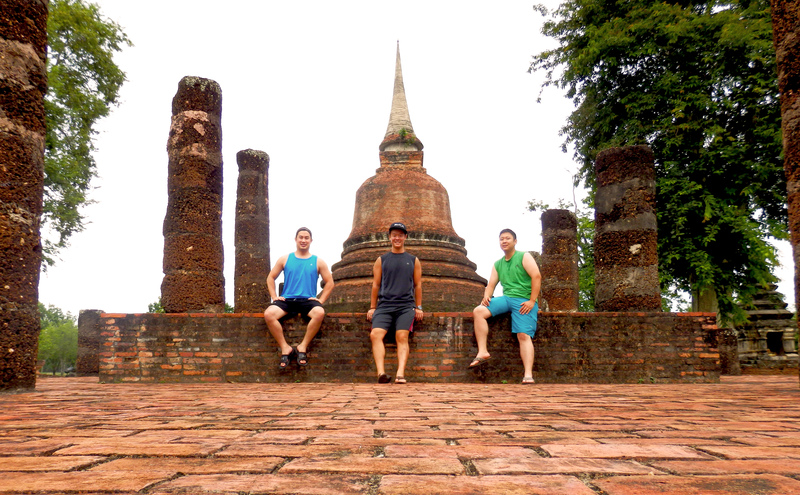 Our time in Sukhothai was brief but it was a prime example of why I love Thailand. 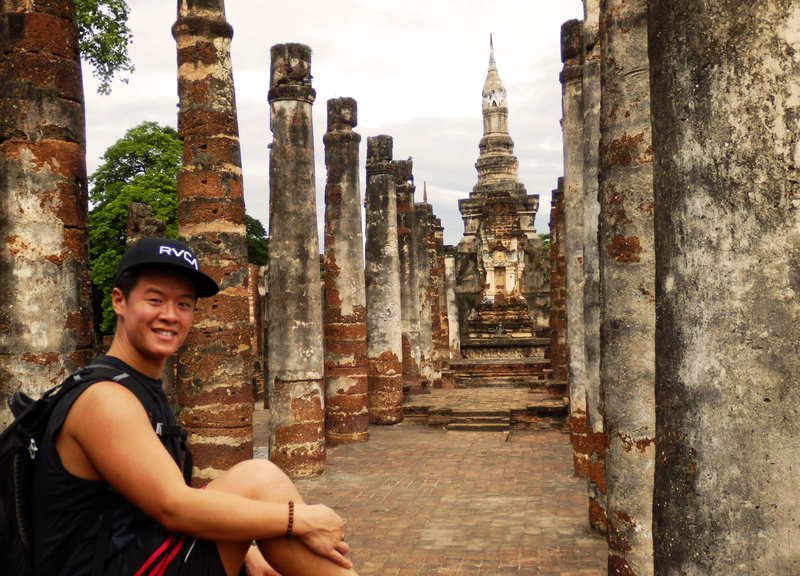 Bangkok was one side of it but finding a quiet corner to yourself is possible. 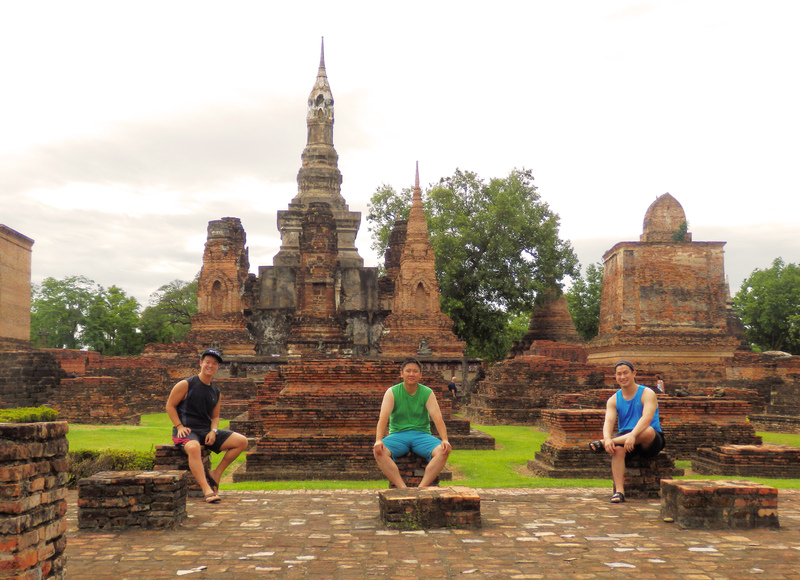 Sukhothai allowed us to get away from the crowd and explore the ruins on our own accord. We didn’t need a tour or permits, just a bike and admission (quite affordable). When we didn’t have a place to stay, we asked locals who were more than willing to try to help, despite their poor English. The lady that did find us a room could have turned us away, but instead offered us a drink, a seat and called a number of guesthouses around the area until she found a place for us to stay. The following day, we asked around again and another wonderful guesthouse took us in (we had to squeeze because the city was flooded with people for the festival).